For the past week, Mr. Painted Quilt and I have been spending anywhere from two to four hours a day working outdoors and admittedly, we’re both tired. We decided to take today off to relax and chill. 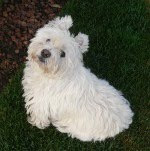 Our house is situated on approximately five acres of land, most of which is to the rear of the house, workshop and barn. When we purchased the house back in December of 2010, we knew that the grounds, almost non-existent flower beds and over grown and neglected shrubs needed a lot of work, some of which we started last spring. When I was diagnosed with cancer, many of our plans were put on hold. This spring, when I was given a clean bill of health, we went at it with a vengeance. The orange azalea and climbing hydrangea that we planted last spring are doing wonderfully. So are the many perennials in the front garden. To give you some perspective of our property, this is the walkway on the left side of the house. The white building on the left is the workshop and storage area where the tractor, tools and gardening equipment reside. Beyond that is what we refer to as the “back 40”, comprised of about three acres of cleared land and an acre of bush. This past week we have been planting trees and evergreens back there and have tilled up two new flower beds and an area where we are going to plant about a dozen blueberry bushes. Those new areas are still a work in progress and we’re hoping to finish them this week. and here they are this morning at 12 days old. They are getting much taller and as a result, we’ve have had to move them from our mud room to the workshop and into a larger box. If you enlarge the picture you should be able to see their wings starting to feather out. It’ll be another four weeks at least before we can transfer them to the chicken coop in the barn. I’ve even been able to fit in a little sewing and stitching in the evenings…when I can keep my eyes open. I joined a pin cushion swap on the Jo Morton Stitchers board and here’s what I’ll be sending off to my partner tomorrow. Yesterday was market day and I was able to pick up some organic lettuce, cherry tomato and hot pepper plants. Below are the tomato plants that I grew from seed. In my travels, these perennials managed to follow me home and are patiently waiting on the potting bench for the new beds to materialize. All of the rhubarb was gone about a week ago and look at what has appeared since then! I picked a slew of the larger stalks this morning and decided to make another batch of stewed rhubarb. I ended up with about 6 cups of chopped rhubarb to which I added about a half a cup of water and one and a half cups of Splenda. and stirred it into the rhubarb mixture. Serve it hot on top of vanilla ice cream or chilled on toast. Guess what we’re having for dessert tonight? Yesterday, our local outdoor farmer’s market opened for the season. Oh happy day! In addition to all the regular vendors, there were a few new ones and of course I had to check them out. One of the new stalls was filled to the brim with quality antiques and quilts. It’s a good thing that I arrived shortly after set up because I’m sure my newest treasure would have made it home with some other appreciative customer rather than me. An antique J & P Coats spool cabinet! I’m not sure if this is where I’ll keep it but until I can find a better place, here is where it’ll stay. I thought that one more crate would do it for some of my neatly folded stash but I definitely need another one to complete the stack. Speaking of stash, there hasn’t been too much happening here lately on the sewing front. Taking care of baby chicks, planting flowers and preparing the veggie garden has taken up most of my and Mr. Painted Quilt’s time. Today, “Les Girls” are five days old…already! They’ve almost doubled in size since we brought them into our mud room and placed them under a heat lamp. It was just too cold for them at this age out in the coop in the barn, but who knew? We’re transplanted city folk and thanks to the advice and guidance of friends and neighbors, we’re learning the ropes very quickly. We’re also in the process of enlarging our ‘kitchen’ garden to make room for some tomatoes, hot peppers, lettuce and onions. Just to be on the safe side, we’ll be planting those next weekend. We still get some cool breezes at night being so close to the ocean. The Annapolis Valley of Nova Scotia is renowned for it’s fruit and veggies so for the two of us, having a large garden is really not worth the time and effort that is required to maintain it. In season, there is an abundance of reasonably priced organically grown produce, especially at our farmer’s market where you can find me bright and early every Saturday morning. The rest of our rhubarb crop will be picked today and I can’t decide whether to make some rhubarb crisp or muffins…or maybe both! What is left over will be frozen to be used as needed. All the hybrid roses that I planted last summer survived the winter and are flourishing. We are also hoping for a bumper crop of apples from the three trees off to the right. Isn’t this rhododendron smashing? Unfortunately the photo does not do it justice because the flowers are actually a deep crimson. The tulips will soon lose their petals and go dormant, just in time for the sweet woodruff in this particular spot to take their place. This is only the second season for our flower beds and everything seems to be healthy and happy and growing like crazy. Both bleeding hearts are enormous and in full bloom right now. Isn’t the white one lovely? I think it’s my favorite of the two. The many greens of spring. You’d almost think we were in Ireland! Rhoda, Ruby and Roxanne…our three Rhode Island Reds that we adopted last spring as adults…were boarded out for the winter because of me being away for six weeks while I was receiving chemo and radiation treatments. We decided to leave them there rather than uproot them again and start anew with babies this spring. The three R’s were adult layers when we got them and had been cooped up with two roosters who would just not leave them alone…if you catch my drift. Ideally, we wanted chickens to be able to free roam on our property but these gals were too old and set in their ways to allow them to do this when we got them. They were also very skittish and although they got used to me going into their coop on a daily basis, they never really ‘warmed’ up to us. Yesterday Mr. 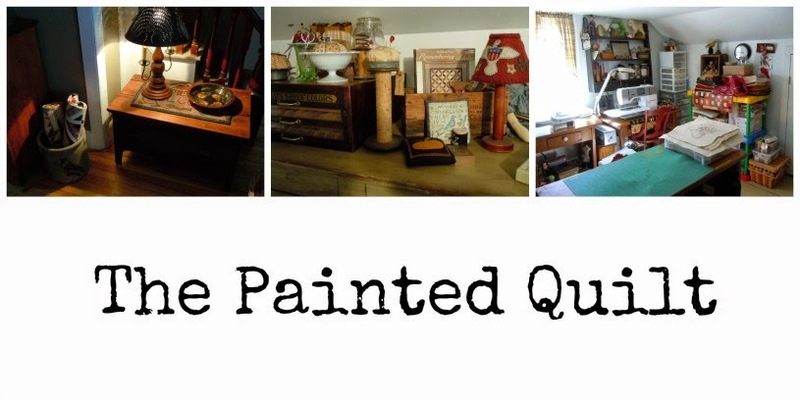 Painted Quilt and I finished tidying up and readying the coop in the barn in anticipation of their arrival. This morning we got the call that our day old chicks were ready to be picked up and taken to their new homes. They are the cutest little things and were following us everywhere and love to be cuddled. Next step is to create a temporary fenced in area and allow them to go in and out as they wish. Hopefully we’ll get that done in the next week or so. Once they reach adult size, we’ll take down the fencing and allow them to hunt, peck and roam the property to their heart’s content. Welcome girls and I hope you like your new digs! Last night, I made this rhubarb pie with some freshly picked rhubarb from our garden. Of course I picked too much and added more rhubarb than the recipe called for so that’s why the top crust is cracking. Better too much than too little I say! Here’s the recipe. I promise you that it’s yum-a-licious! Whisk the above ingredients together. To this, add 3 C of chopped rhubarb and toss until all the rhubarb is coated with the mixture. Turn the mixture into an unbaked 9” pie crust and cover with top pie crust. Cut slits in the top to vent. Bake at 375F for 45 minutes or until the top is golden brown and the filling is bubbling. Serve warm or cold. Gotta go check on the girls! FFF and BOM files updated! It’s taken me most of last evening and another two hours this morning to complete the transfer of all the FFF files as well as my Raggedy & Friends BOM to Google Docs…and it wasn’t easy. My computer skills are not the best and it was a ‘learn-as-you-go’ experience for me. How the February 2010 FFF post appeared this morning is a mystery to me but has now been deleted and I believe that everything is now fixed, moved, readily accessible and tickety-poo! Once again, thanks to all of you who suggested that I use Google Docs. It is much easier to use and appears to be very user friendly. 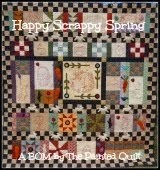 For those of you who might be new here, I offered a free BOM of my Raggedy & Friends quilt back in 2010. If you would like to make this quilt, the PDF files are available for you to download by clicking on the links on the right sidebar of my blog…and they’re FREE! 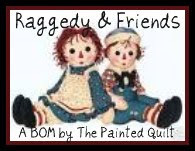 They are listed under “Links to Raggedy & Friends BOM Patterns”. This morning I went for a tour around the gardens…care to join me? Tulips…is there any other flower that represents spring better? An early blooming azalea…a real splash of color in a spring garden. This sign says it all…’welcome’ to our home. I love situating plants with different colors and textures next to one another. “Supertunias”…a new variety this year…and they require no dead-heading! Bleeding hearts…another of my favorites. Our three apple trees are in full blossom. Ah spring! I hope you all have a great day. If you’re looking for me, I’ll be out playing in the dirt! I had never heard of Google Docs until a couple of days ago when I whined about having problems with Scribd and asked for your help to find a reliable hosting site for my FFF PDF files. So many of you came to my rescue and suggested that I give Google Docs a try. After several attempts at trying to figure out how to upload the file, I finally ‘got it’ and have since replaced the link on my FFF post which you can find HERE. With your help, I think ‘we’ have found the solution! You all are the greatest and I am so grateful for your help. Thank you, thank you, thank you! If you happen to try to download the Spring Floral Needle Case using the new link, could you please let me know if you have any problems? As you can imagine, we’re finding it pretty lonely here without Mac. I think Frankie is feeling lonely as well because since Mac’s passing, he has taken to sleeping in Mac’s bed…something he never did before. After sorting through, folding and tidying my stash a short while ago, I made a promise to myself that I wouldn’t buy any new fabric unless I absolutely needed to. Well, I absolutely needed to have these! Some time ago during the winter months, Candace from Squash House Quilts sent me some tomato seeds that were developed at Rutgers University. Traditionally, planting time for tender seedlings and veggies in Canada is no sooner than the third weekend in May. I planted the seeds indoors about two weeks ago and here they are now, happily basking in the sun on the window sill in my dining room. The tallest one is about 7” high and they are getting stronger every day. Next week one of our friends is coming by with his tiller and not only will he be enlarging our veggie garden area but he is also going to till two new flower beds for me. So guess what I’ve been doing? Stalking the nurseries and buying a whole slew of perennials with a few annuals thrown in for color! We’ve had heavy rain and high winds for the past two days and as a result, the ground is too wet to plant just yet. The three different varieties of rhubarb that I planted last spring in the herb garden right outside our back door are growing like crazy and I’ll be picking my first batch tomorrow. The chives are about 10” tall and the annual herbs will be planted sometime this week. Freshly stewed rhubarb on toast for breakfast…not to mention strawberry rhubarb pie…heavenly! Our local farmer’s market is having it’s annual “rare and unusual” plant sale tomorrow morning so you know where I’ll be! The rhubarb will have to wait until I get home.